For those of you already familiar with Google Analytics, here’s a great tip that will allow you to assign tree resolutions as Goals. Setting up goal tracking for your trees will give you deeper insight about how different classes of users are interacting with your trees. 3. From there, select +New Goal and then Custom from the Goal options. 5. Populate the Event Category and Event Action, as specified below (for resolved trees). 6. Use the Verify feature to make sure that you have everything set up properly. 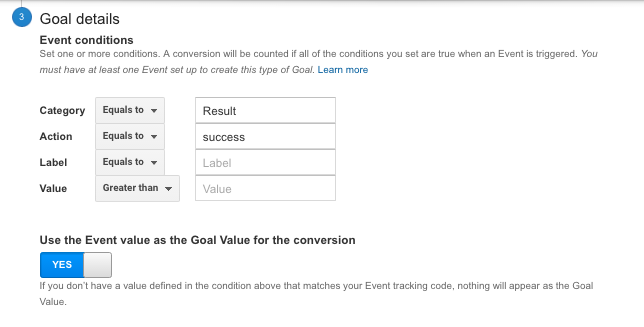 Goal tracking will only apply to data that comes into Google Analytics AFTER the goal tracking is set up. It will not retroactively apply to old data. When goal tracking is set up, you can begin segmenting your data by Goal Completion by selecting the “Goal Set x” option above the chart in most of your reports. Quick disclaimer about interpreting your data: Due to the limitations of Google Analytics’ Event Tracking functionality, a “success” and “failure” event can be associated to the same session. Because events are fired based on when a page is viewed, if a user views a “success” and “failure” node in the same session, both events will appear in Google Analytics. 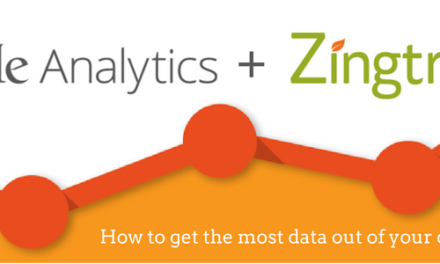 In our experience, these instances are generally isolated, but feel free to also consult Zingtree’s internal reporting for more data about tree resolution.